So about 2 weeks ago, a truly horrible, shocking thing happened with the Manchester bombing. It just makes no sense. Its just so sad. What made it even worse (if possible) was because it was basically a kids concert, there were so many children in the audience. Sadly 22 people passed away and many others injured. I remember late-ish on that Monday watching TV and then just checking Twitter and seeing something. Thought (or maybe more hope) that it wasn’t as serious as it sounded. With social media and the world we live in, there were all sorts of fake news on Twitter which didn’t help things at all. Almost immediately, after a horrific event, we did see the good in people. People offering lifts, places to stay, taxi drivers driving people home. Out of something so bad though, we have seen in the past couple weeks the good in people. Lots of money donated including support from all around the world, people getting tattoos and then money going towards charity, children making cakes to raise money, loads of people donating blood. I read about a boy who was sad he was too young to donate so he bought sweets for the doctors and nurses. 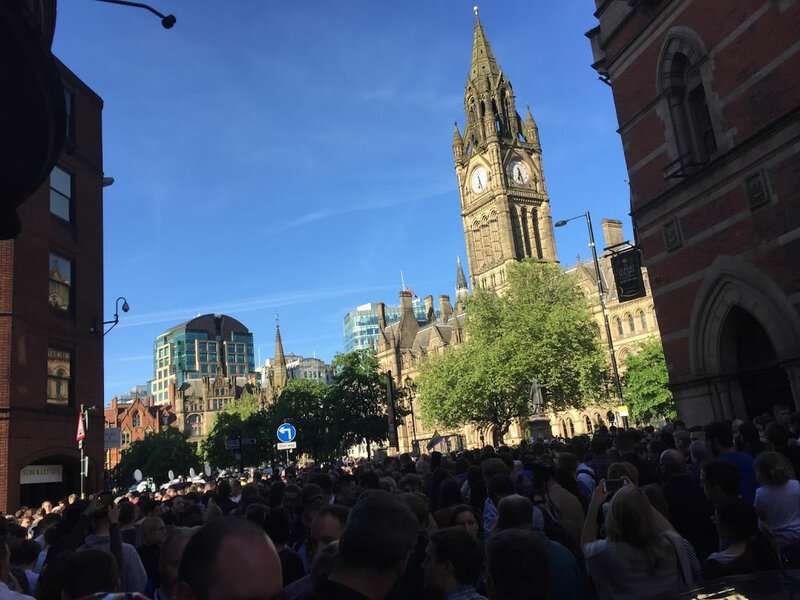 There was a vigil in Albert Square the day after and loads of people turned up. It was also where Tony Walsh read out his emotional, brilliant This is The Place poem. Lots of people had left flowers around Albert Square, St. Ann’s Square and by the Cenotaph – although this was shortly all moved to St. Ann’s Square. Part of the reason was because of the City Games which was on the following weekend and they were about to set things up. 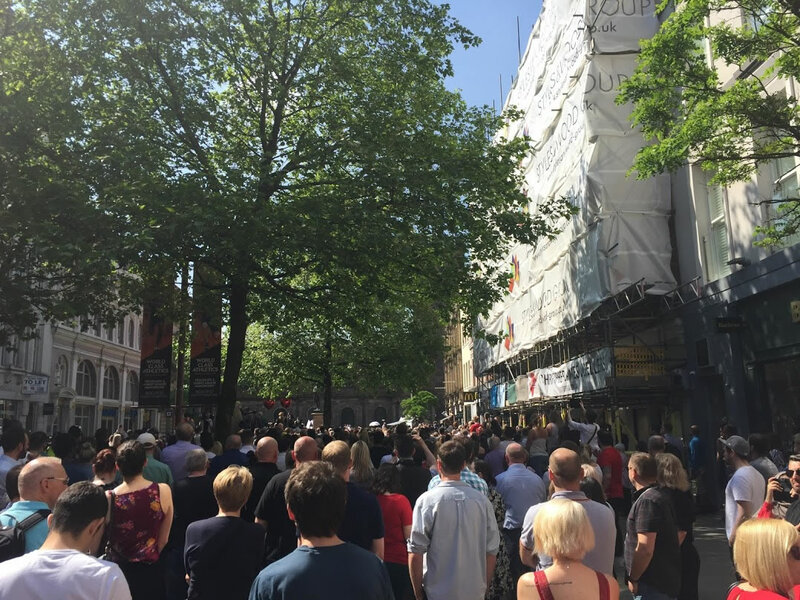 There was also a vigil in St. Ann’s Square which I also went to and this is where there was the minute’s silence and also where some people started singing Don’t Look Back in Anger. Some balloons were also released from a nearby building, and they all floated up and sort of towards the Manchester Arena. There are now so many flowers and messages etc in St. Ann’s Square its incredible. 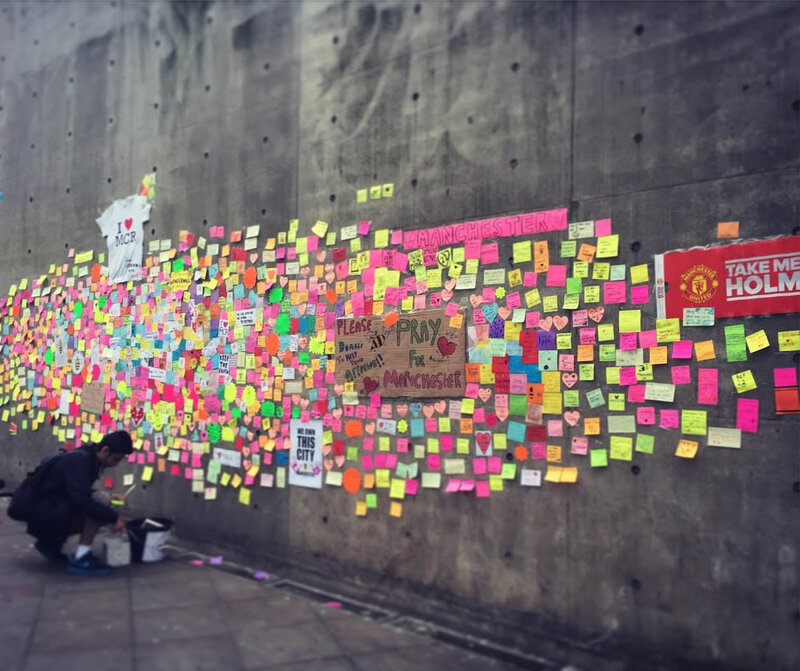 Also, there was something done in Piccadilly Gardens with someone coming up with idea of writing messages on Post-It notes and sticking them on the ugly grey walls – it was called #Wonderwall. This I heard was removed the day after?? Don’t Look Back in Anger sort of became “the” song for this whole thing. In a Courteeners gig in Old Trafford cricket ground, they played the song and the crowd all sang it. Saw the video online and its brilliant. The following week, Liam Gallagher played a charity gig in Manchester – he also played 3 others around country – for the Manchester bomb appeal. And just last night (and probably same tonight), Robbie Williams is playing in Manchester. Its not a charity gig but because of what happened, he changed some song lyrics. And when he sang Angels, he broke down in tears and struggled to continue – the crowd helping him sing it. Amazing! Here is an article on Manchester Evening News web site, lists 100 “small” things which have been done that have made a big difference to the Manchester bomb appeal. There are still other things happening such as a mural currently being painted on side of the building in Northern Quarter of 22 giant bees – bees the symbol of Manchester if you didn’t know. All since the days of the Industrial Revolutions and the textile mills were described as “hives of activity”. One final thing. Although the response in Manchester and all the support shown around the world for Manchester has been amazing, it should not be forgotten that there is horrible things happening almost every day. Its happening so often! On the same day as Manchester bombing, something horrible happened in Syria and also I think in Bangkok. But the Manchester bombing made the mainstream news around the world. There is no simple solution, I for sure don’t know what can be done in this world but its really messed up at the moment.